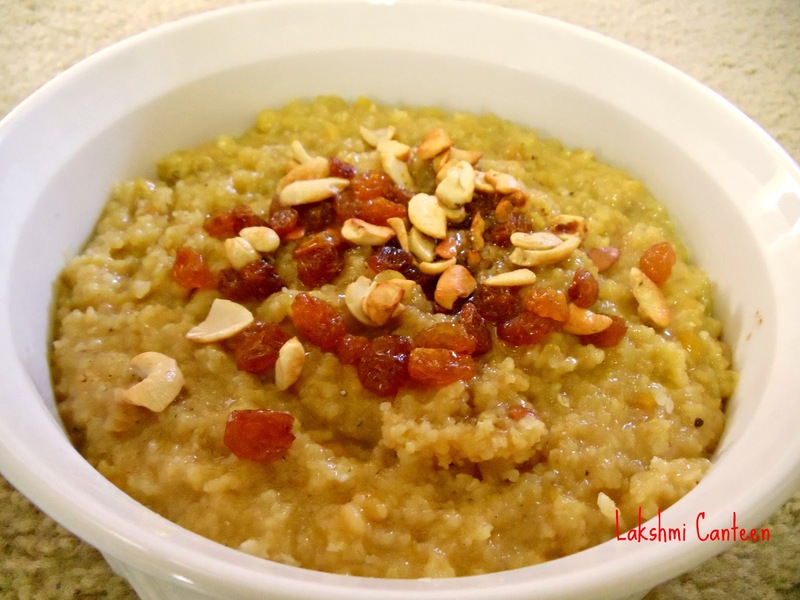 Gova Kanache Khichidi is a very healthy dessert. Gova Kana in konkani means broken wheat. This pudding is sweetened using jaggery and demands less ghee. I had also posted one more khichidi in my earlier post. Check the recipe for it here. So enjoy making this easy, old and healthy dessert. Fry chana dal in pan for few minutes, until there is a slight change in its color and a nice aroma is got. Now mix this with broken wheat and cook in a pressure cooker for three whistles, by adding required amount of water (I added 2 cups of water). Now keep the cooked broken wheat- chana dal mixture on a flame and add powdered jaggery and mix well (Add water if it is too dry. I didn't add water). 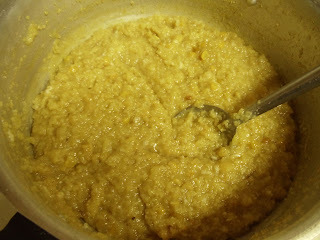 Once the jaggery mixes well with the broken wheat-chana dal mixture, add grated coconut and 1-2 Tbsp of ghee. Continue heating for five more minutes with constant stirring and turn off the heat. Now add cardamom powder and garnish it with cashew nut and raisins fried in ghee. Gova Kana Khichidi is ready!! Serve it hot with an extra topping of ghee. Above measurement serves 3-4 people. Note: You can substitute sugar for jaggery. Even this way, it gives good results.